Welcome to the Lazy Fish – a stunning barn conversion set in the breath-taking countryside of the Lake District. You may have considered luxury hotels or luxury cottages in the Lake District, but none of them compare to the Lazy Fish. Relax in our unique self-catering accommodation, unwind in our fabulous outdoor spa pool or curl up in our spacious living room in front of the roaring wood burning stove. It’s the perfect place for an action-packed family break, a get-together with friends or to spend your honeymoon in the Lake District. Here at the Lazy Fish we guarantee you a truly tranquil retreat. 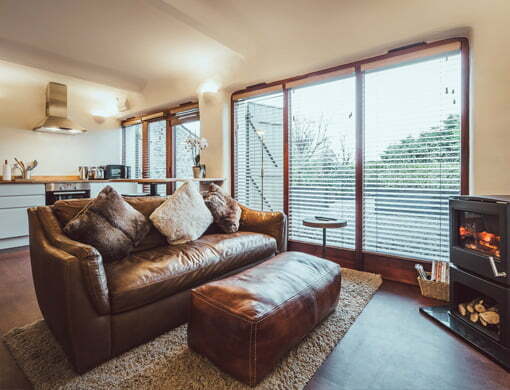 Situated next door to the Lazy Fish, the Little Fish is a contemporary, cosy, well-appointed studio for two. Soak in the sumptuous double bath whilst listening to the babble of the brook outside. Enjoy the private courtyard with BBQ and outdoor eating space. Or on wintery nights close the French-style shutters and snuggle next to the fire in our blissful retreat. It's the perfect place for a romantic getaway. "Once again the Lazy Fish didn't disappoint. It's an amazing barn, perfect for a family holiday and so well kept. Mark and Rachel always make us feel so welcome - we look forward to our next visit." The Lazy Fish and The Little Fish - luxury self catering in the heart of the Northern Fells of the Lake District. For a complete getaway all you need to bring is you.